Take the teleferic (cable car) up to the castle, wander around the Olympic Ring, call by an art museum or two, and finish with a performance at the Magic Fountain. 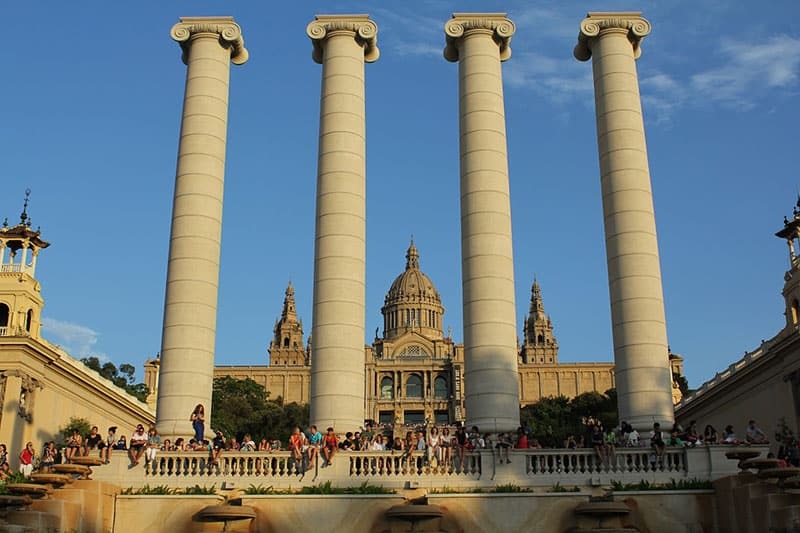 We look at what there is do on Barcelona’s Montjuic mountain, and how to get there. 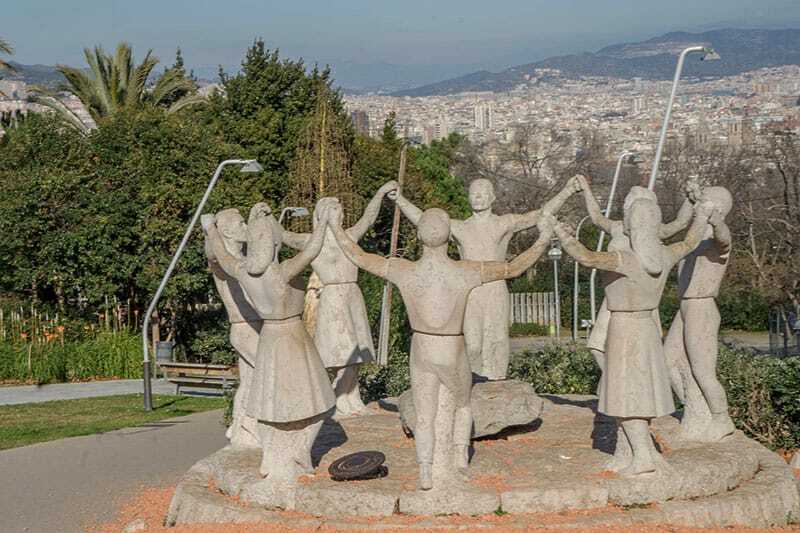 A scenic wooded hill in the South West of Barcelona, rising 173m above sea level in between Plaça Espanya and the commercial port, Montjuic gets its name from the Catalan meaning ‘Jewish Mountain’, and was once the home of the city’s Jewish community. If you’re wondering, it is pronounced moɲ.d͡ʒuˈik. 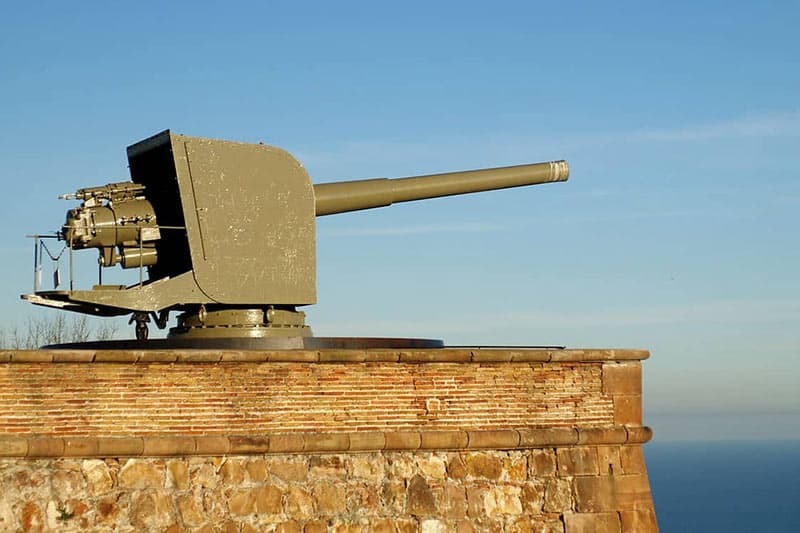 Thanks to its raised altitude, the hill was chosen as the site for the Castell de Montjuic fortification, which far from protecting the city in fact bombed it during the 1842 insurrection when Barcelona rose up against the Spanish government in Madrid. 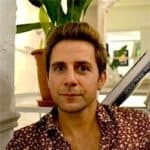 The garrison continued to be a sinister symbol on high for the rest of the century and beyond, serving as a political prison and even a place of execution for dissidents such as Catalan nationalist Lluis Companys who was killed there in 1940 by Franco’s men. 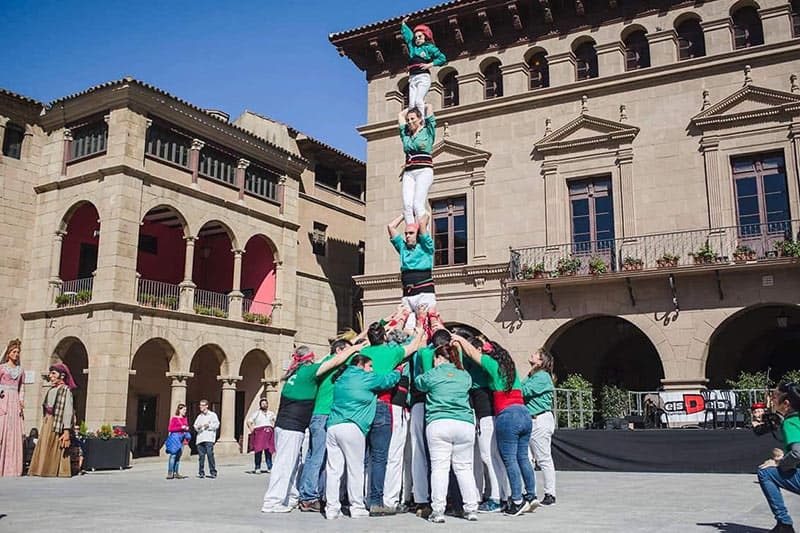 Today’s visitor to Montjuic is scarcely likely to feel any of these evil associations as they wonder around the mountain’s cultural treasures, surrounded by woodland, in what has become one of the most attractive areas of Barcelona. In the 1920s the hill was chosen as the site for several exciting new developments in time for the International Fair 1929. Amongst the new markers on Barcelona’s cultural map were the fabulous Palau Nacional, a majestic palace which now hosts the National Museum of Catalan Art, the Font Magica (Magic Fountain), an impressive waterworks which spurts to the tune of classical music and still functions today, and Poble Espanyol, a mock-Spanish village designed to showcase the various regional styles of architecture on the peninsula, which has subsequently become one of Barcelona’s most popular tourist attractions. (Keep reading for more on all of these sights below!). Also built around that time was the Olympic Stadium, designed for the 1936 Games, however Barcelona lost out to Berlin… there were plans to stage an anti-fascist Games in their place but the Spanish Civil War put an end to that. Thankfully all that brick-lugging was worth it in the end however as Barcelona did finally get there Olympic Games – in 1992. 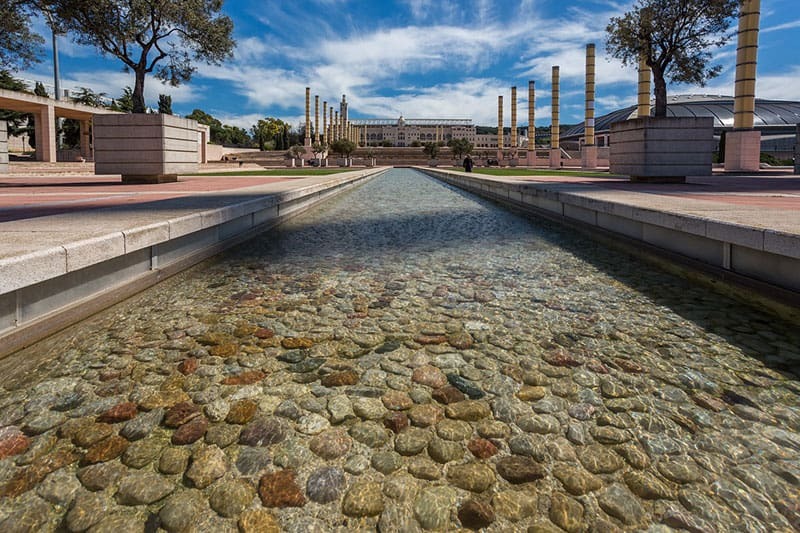 Around this time Montjuic saw a second wave of exciting projects, as many of the constructions built for the 1929 Fair were renovated, such as the Olympic diving pool, and several more were added. 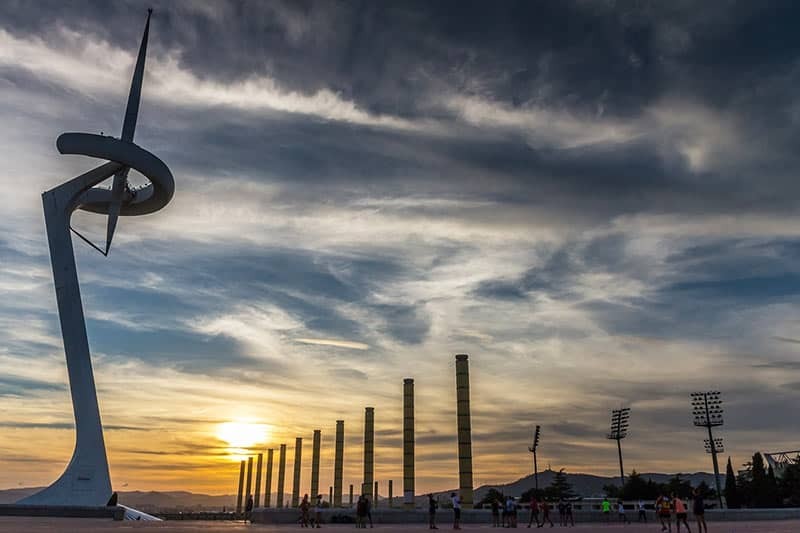 Most notably an ‘Anella Olympic’ or Olympic Ring of facilities was constructed, based around the renovated Olympic Stadium, which included the Sant Jordi Palace sports hall, the Picornell Olympic swimming pools (named after a Catalan waterbaby) and the Torre Telefonica Communications Tower, designed by starchitect Santiago Calatrava to transmit the Games on television. The aforementioned fortress is not top of any Catalan’s list of favourite buildings, owing to its partisan history, however it’s fun to walk or take the cable car up to the top of the hill and explore the former military garrison. As well as checking out the parade crowd and watchtower, these days you can also delve into its dungeons. Meanwhile the views over Barcelona’s commercial port are spectacular. More info here. 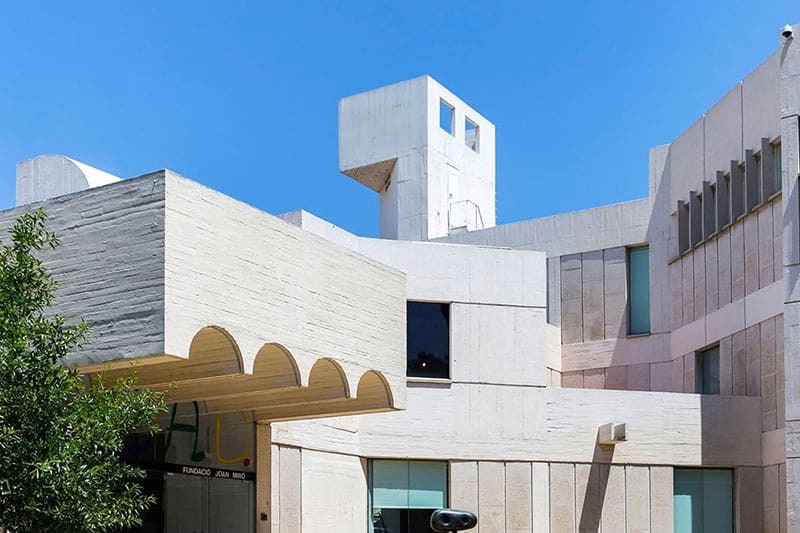 One of Catalonia’s most famous artists, Joan Miro, is celebrated at his eponymous foundation, a vast museum of over 14,000 of his works. 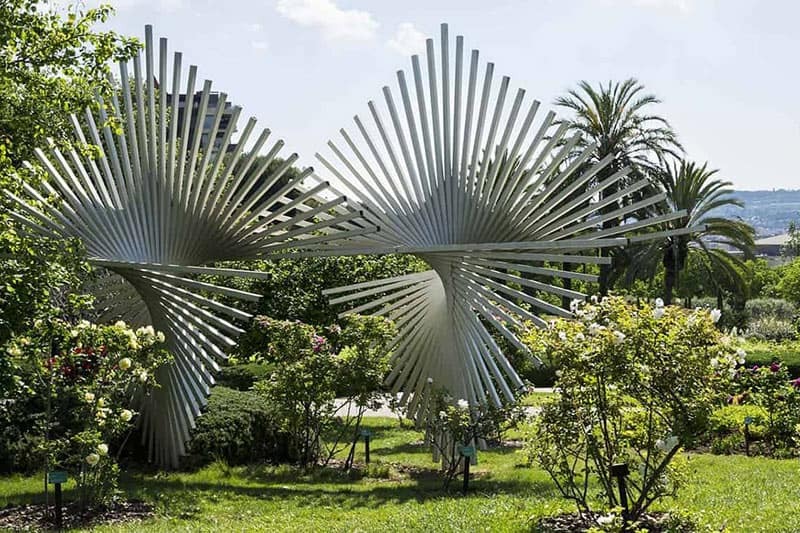 A true Catalan, he tried to embody the national soul in his bold abstract paintings and sculptures. A must for lovers of 20th century art. It’s hard to describe this mock Spanish village in a word or two, and indeed it was scheduled to be demolished after the 1929 International Fair. However it has survived as a kind of living museum to Spanish culture, with a mix of traditional artisan shops, flamenco tablaos, restaurants, bars and even nightclubs. One thing’s for sure, there’s always something going on here! Check out their opening hours, website and more info here. The Olympic Ring, or Anella Olimpica, is the name given to the assortment of buildings built or renovated for the 1992 Summer Games. You can’t go inside most of them unless there’s an event (aside from sporting occasions, a lot of big name bands play in the Stadium and the adjacent Palau Sant Jordi), but it’s a beautifully landscaped zone, with water features and colonnades, and there’s also Calatrava’s epic telecommunications needle, arguably the world’s most beautiful telecoms tower, so overall it’s a great place to walk around and take some photos. Opposite the stadium you’ll also find the Olympic and Sport Museum. I’m going to be brutal here and say the ground floor of the Museu Nacional d’Art de Catalunya makes for a pretty tedious slog. Lots and lots and lots of medieval religious iconography. But guess what, MNAC is actually my favourite museum in Barcelona thanks to its modern art collection exhibited on the 1st floor. Here you’ll find arresting works by Picasso, Dali, Ramon Casas and many more of Barcelona’s most influential artists of the late 19th and early 20th century (this period marked the city’s creative zenith!). There’s even some furniture by the peerless Antoni Gaudi himself. You can visit for free on Saturday after 3pm, or the first Sunday of the month. Otherwise tickets are reasonably priced at 12 euros, and you can buy them online (see button below!). 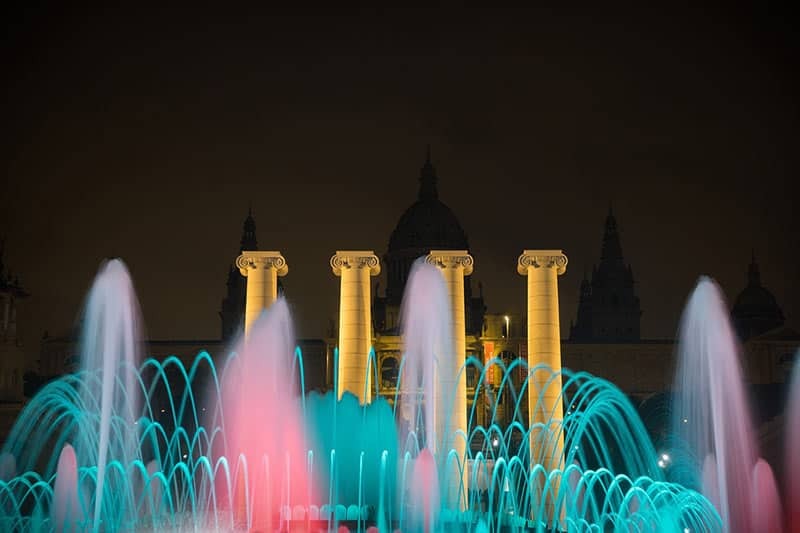 One of the most popular things to do in Barcelona with tourists is catch a performance at the Magic Fountain, which you can find at the foot of the MNAC, just near Placa Espanya metro station (walk past the twin Venetian Towers and keep going!). From Thurs to Sunday in the summer months (Friday and Saturday in winter), there are several 15 minute shows a night, when the 3,620 water jets go berserk to a soundtrack of classic and pop hits, lit up every colour of the rainbow. Kitsch but fun. 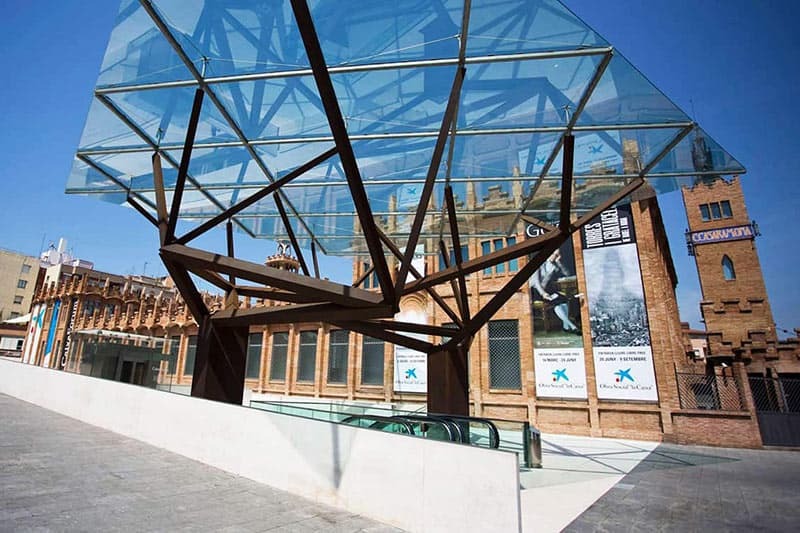 The superb Caixa Forum is a former factory-turned-exhibition space, with a never-ending rotation of fascinating exhibitions – many of them free. The original building was designed by Puig i Cadafalch, a contemporary of Gaudi’s, and its red brick splendour is a classic example of Catalan Modernista architecture. Montjuic is effectively one big park, sprawling over an entire hill, but parts of it are more special than others. That’s certainly the case with the delightful Botanical Gardens, which is home to well over a 1,000 species of Mediterranean flora. Best of all, its free to enter and walk around. 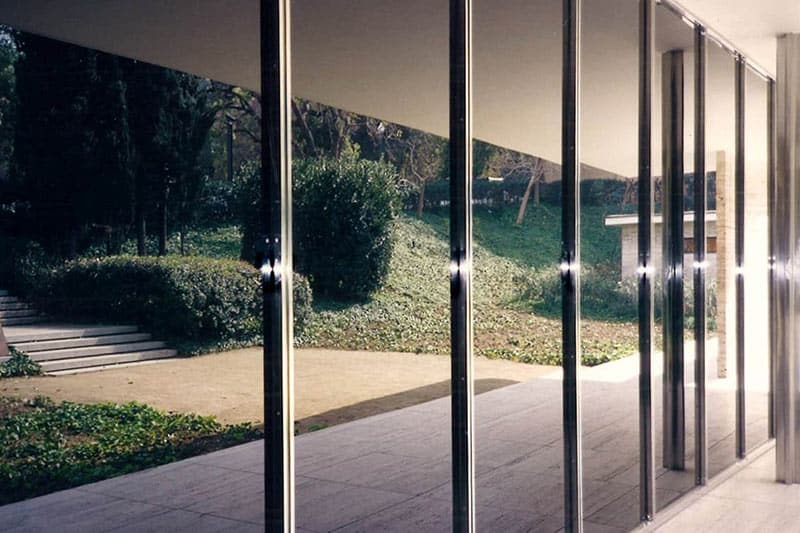 The Pavelló Alemany is a small showcase building designed by Mies van der Rohe (who also for designed the famous Barcelona Chair) for the 1929 International Fair. To the casual observer it might not be that exciting, but to architect buffs who know a cutting edge (at the time) edifice when they see one, this serene pavilion is a subject of fascination. 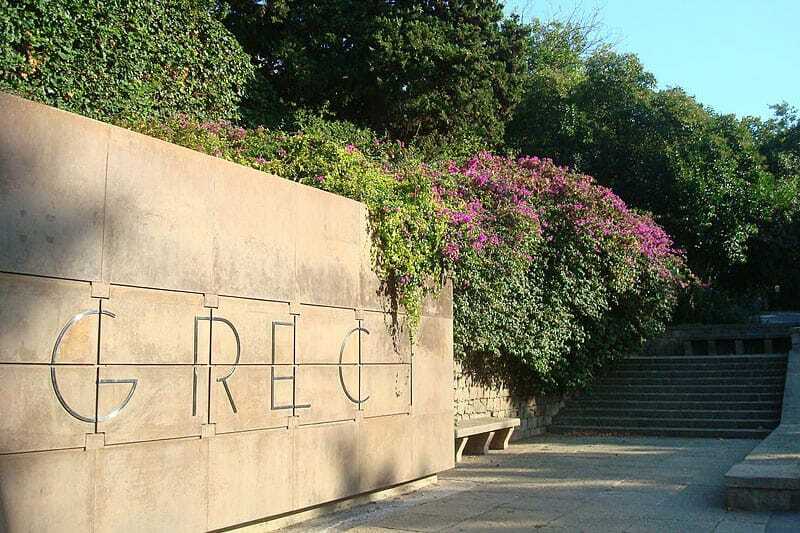 Another cultural attraction built for the 1929 International Fair, the wonderfully romantic Teatre Grec (Greek Theatre) is an open air amphitheatre, like those from antiquity, that hosts al fresco performances throughout the year – most notably at the Grec Festival. There’s a nice little bar-restaurant called Cafe Belgrado on the grounds if you need a little pitstop. On the far side of the mountain, and somewhat inaccessible, I wouldn’t recommend this cemetery to anyone with limited time in Barcelona. There are other more interesting, and much more convenient, sites to visit. Nonetheless, if you do have time, it’s an atmospheric place, overlooking the sea, with many marvellous, richly-decorated tombs. 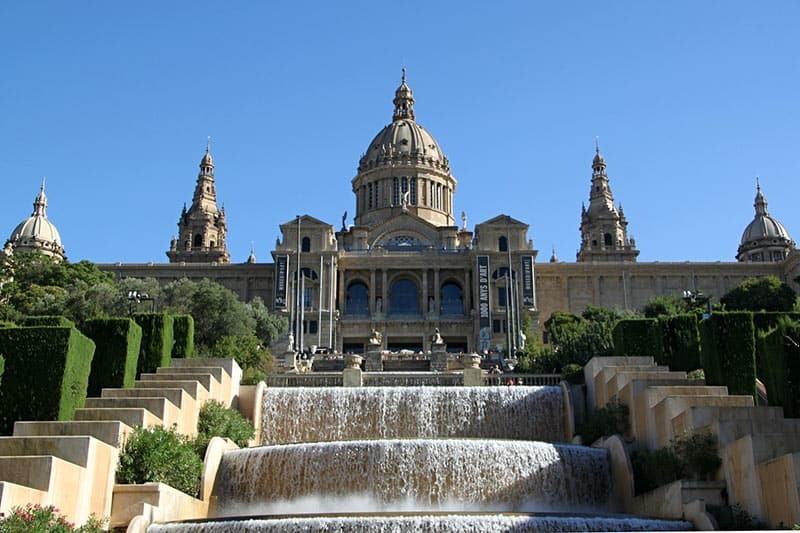 Several famous dignitaries are laid to rest here, including Lluis Companys, the president of Catalonia who was executed at Montjuic Castle, and the artists Joan Miro (whose museum I already mentioned! ), Ramon Casas and Santiago Rusinol. How Do I Get to Montjuic? Montjuic is a massive hill that can be accessed any number of ways, especially if you’re willing to hike a bit, but to all intents and purposes there are two practical ways of getting here. 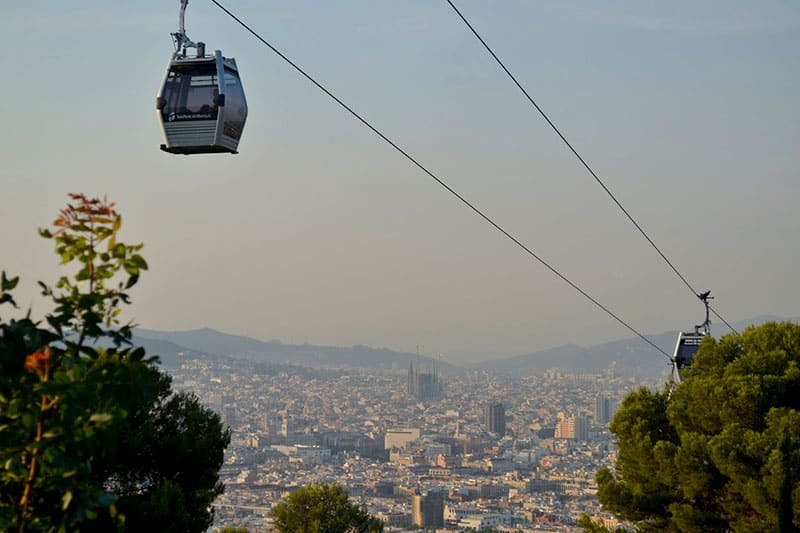 The first is by the Montjuic funicular train that leaves from Paral-lel metro station, and which takes you to the side of the mountain with the castle, and places you within comfortable distance of the fortress, Olympic Ring and Joan Miro Foundation. The second is from Placa Espanya metro station, which drops you off near the Magic Fountain and the National Museum of Catalan Art (MNAC). If you take the funicular, afterwards the teleferic (cable car) will give you a boost if you want to make it all the way to the castle. Meanwhile the tourist bus is handy for those who want to cram a lot in, as the attractions are spaced a fair bit apart. More info on each below. This funicular is a one track, one train system, that shuttles tourists and locals up from Paral-lel metro station, towards many of the cultural treasures awaiting on the leafy slopes of this wonderful hill. It saves you from traipsing up through the Poble Sec district and probably getting lost on the confusing winding paths at the foot of the slopes. I’d highly recommend it, it will save you a tonne of time and energy. It leaves every 10 minutes or so and the journey time is only 2 or 3 minutes. If you’ve already ridden the metro to Paral-lel you can ride the funicular as an extension to your metro journey, at no additional cost. If not you need to buy a single metro ticket. After taking the Funicular half way up the hill, the Teleferic de Montjuic Cable Car will finish the job, hoisting you up the slope right up to the Montjuic Castle. Riding this ski-style carriage is considered an attraction unto itself, and a popular one at that, so you might want to secure your tickets in advance. From this side of the mountain you can look over the whole city, as well as down over Barcelona’s sprawling commercial port. Plus, of course, you visit the castle. To access the attractions on the other side of the mountain take the metro to Placa Espanya and approach between the 47m high twin Venetian Towers. Here you will find the Magic Fountain, the MNAC and you should also head to Placa Espanya if to visit Poble Espanyol or Caixa Forum. The red route of Barcelona’s Tourist Bus makes a total of 7 stops on Montjuic, which are, in order, Caixa Forum / Mies Van Der Rohe Pavilion, Poble Espanyol, MNAC, Olympic Ring, Joan Miro Foundation, Teleferic de Montjuic (Cable Car), Miramar Jardins Costa i Llobera. In fact you can access everything on our list of 11 top attractions with the bus, except the cemetery. For the castle, you would need to get off at the teleferic stop and take the cable car, or walk up. You can buy tickets via Get Your Guide. Take Barcelona eBikes “View Tour” and you’ll leave the flat Old Town and power your way effortlessly up the slopes of Montjuic, via the winding paths of the cactus gardens, up to the mirador for panoramic vistas over the port, Mediterranean and entire cityscape! After that you’ll take in some of the mountains other top attractions, like the Caixa Forum and palatial MNAC, all without breaking into a sweat, thanks to eBike’s electric power assisted pedalling! A great way to cover everything Montjuic has to offer in just a few hours. You can find all of the mountain’s many attractions on a map on this page.